I am delighted to be here today to inaugurate the Platinum Jubilee celebrations of Bharatiya Vidya Bhavan and the 125th Birth Anniversary of its illustrious founder, Dr. K.M. Munshi. Dr. K.M Munshi was a true visionary, institution-builder and a great son of India. He was of a small build. But there was nothing small in what he achieved during his life time. He was a towering personality who became a legend in his own life time. Munshiji demonstrated excellence in diverse fields of human endeavour. He was a writer, speaker, novelist, lawyer, teacher, Indologist, Constitutional expert, Administrator, Statesman, patriot and a promoter and sustainer of cultural, ethical and moral values. His endeavor of establishing Bhartiya Vidya Bhawan, in 1938, was one of the most important steps in a series of selfless efforts put in by him in emancipating the citizenry of this nation. The founding of the Bhavan echoed his deeply entrenched belief in the instrument of education, which he firmly believed could offer wings to the growth and development of India. Born in the town of Bharuch, Gujarat, 125 years ago, Munshiji was always an excellent student. His life was tremendously influenced by Sri Aurobindo Ghosh. He took up law at the University of Bombay and enrolled himself as an advocate in 1913. He acquired the reputation of a diligent and hardworking lawyer within a short span of time. During World War I, he was greatly influenced by Dr. Annie Besant’s Home Rule Movement until he came across a relatively better concept of governance which Gandhiji offered. This led him to offer his whole hearted support for Sardar Patel’s Bardoli movement and Gandhiji’s salt satyagraha. His active participation brought him in close quarters with Gandhiji and Sardar Patel, who mobilized his active participation within the Congress. He started the movement for a Parliamentary wing of the Congress, became Secretary of the Congress Parliamentary Board in 1938 and served in the Central Legislative Assembly in the 1930s. Gandhiji ignited Munshiji’s zeal to serve the nation through active politics. It is said that Aurobindo Ghosh instilled in him the love for jnanayoga while Gandhiji made him a Karmayogi. Munshiji’s contributions as Union Minister of Food and Agriculture from 1950-52 and Governor of the State of Uttar Pradesh from 1952 to 1957 were invaluable. He also made far reaching contribution to the shaping of the Indian Constitution. His incisive understanding of law and insight into India’s cultural fabric made him one of the most outstanding members of the Constituent Assembly. What might amaze many is that besides being on the Drafting committee, he was member of as many as eleven Committees, which made him perhaps the only Indian who played such a pervasive role in the drafting of the Constitution. The principle of guaranteeing to every person equal protection of the laws was the result of a draft jointly written by Munshiji and Dr. Ambedkar. Munshiji’s sense of equality did not confine itself to mere legal protection. He strongly advocated widow remarriage and to set an example, himself married a widow Lilavati Sheth in 1926. Societal discrimination for delinquent children drove him to found a Children’s Home for delinquent children at Chembur, Bombay in 1939. His love and service to countrymen was thus unparalleled and driven by a strong sense of personal commitment. A prolific writer and conscientious journalist, Munshiji started a Gujarati monthly called Bhargava, was joint-editor of Young India, and he started the Bhavan’s Journal in 1954. Some of his better-known books are: Gujarat and its Literature, Akhand Hindustan, Glory that was Gujardesh, The Ruin that Britain Wrought, The End of an Era, and Shishu ane Sakhi. He was also President of the Sanskrit Viswa Parishad, the Gujarati Sahitya Parishad, and the Hindi Sahitya Sammelan. Munshiji was one among three great dreamers of our country. One was Mahatma Gandhi himself, who dreamt of a world without violence, a world of love and compassion. The second dreamer was Pandit Jawaharlal Nehru who dreamt of an India strong, united and democratic, playing an important role in the world. Munshiji was the third dreamer. He dreamt of a cultural renaissance built on modifying the spiritual heritage of our country to suit modern conditions. He wanted to make sure that every young person of his times and of the future should imbibe and benefit from India’s cultural and spiritual heritage. Munshiji wrote: “The values of a culture are recaptured for each generation by a subtle process of re-interpretation, reintegration and adaptation. When the Culture is living, the promising young man and woman of the generation receive the impact of its fundamental values. The sensitive and the vigorous among them become each a human laboratory, which purifies the fundamental values relating them afresh to the central idea; stimulates them to meet the needs of the times; reintegrate the subsidiary values with the fresh vigour of the new interpretation and shapes the traditions and institutions not only without impairing the strength of the collective will, but by giving it a new edge “. Three quarters of a century ago, Munshiji could foretell the impending turmoil over moral and ethical values. He believed that freedom would be meaningless and worthless unless cultural, ethical, and moral values are enshrined in the hearts and minds of our people. Munshiji therefore felt the need to create an institution that could begin to bring about in a small way a tangible change through education. Bharatiya Vidya Bhavan which was started as an institution is now a massive cultural and educational movement. It is a moral movement that steers people towards a life guided by ethics. The Bhavan, is today rendering yeoman service to the people of our nation and through them to entire human kind. The Bhavan has not merely adopted, as its motto the Rig Vedic proclamation “Vasudaiva Kutumbakam”, but proves it through its words and deeds. What Munshiji expected to achieve through the Bhavan can be narrowed down to three main points: Firstly, he wanted the other worldliness in the outlook of people to be replaced by a sense of joy in the life as it is to be lived. Secondly, he felt that outmoded traditions which stifle the creative vitality of individual and collective life must be replaced by a vigorous flexible attitude to life. And, thirdly, the fundamental values which have given ageless inspiration to our culture had to be captured afresh for our generation. Movements such as the Bhavan are the need of the day. 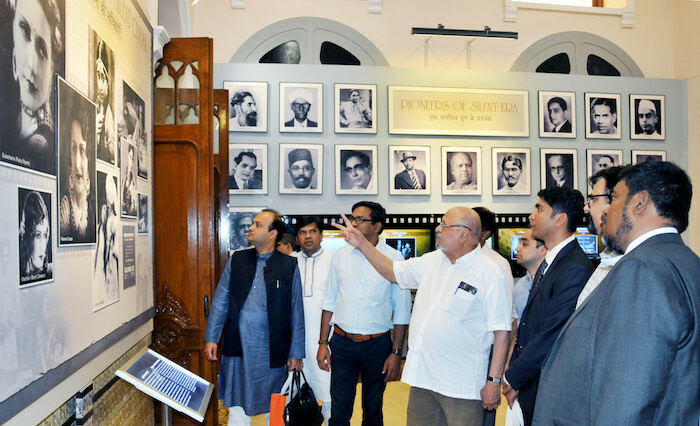 The Bhartiya Vidya Bhavan has stood the test of time and been a beacon light guiding Indians and foreigners alike in their path to live a balanced and wholesome life. With 119 centers in India and around 7 centers abroad including the United States and the United Kingdom, Munshiji’s dream of promoting ethical and spiritual values in day to day life is successfully accomplished by the Bhartiya Vidya Bhavan. I pay my compliments to the staff of Bharatiya Viday Bhawan for their tireless efforts in translating Munshiji vision into reality. 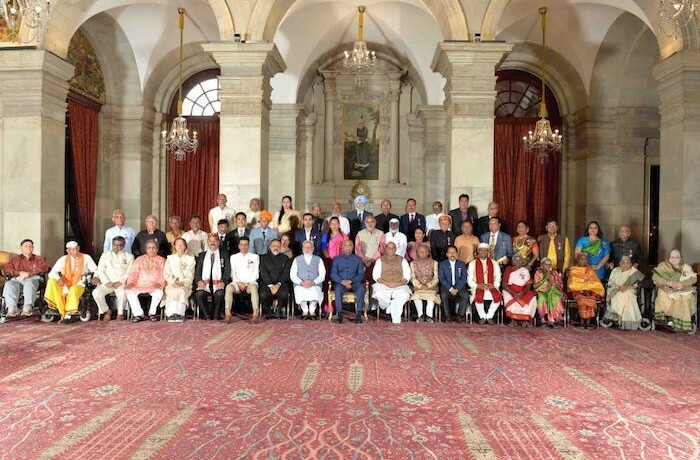 The Bharatiya Vidya Bhavan confers its highest honour – its Honorary Membership on those who have rendered outstanding services to the people of our country as well as the world. It has conferred this honour on three outstanding citizens of our country today. Each one of them is a brilliant star in their chosen field of activity. I congratulate Bhavan on its wonderful choice. 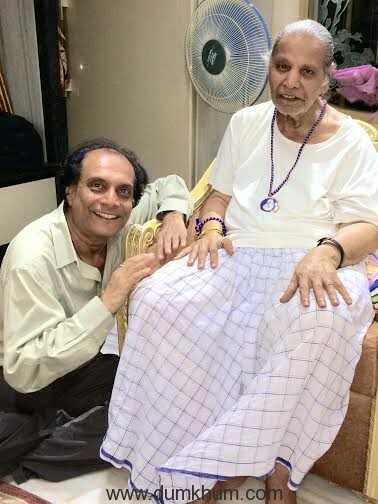 Shrimati Kishori Amonkar, a towering maestro of Hindustani Shashtriya Sangeet, and legendary performer of Jaipur-atrauli Gharana, has given us pure joy for over half a century. Shrimati Ila Bhatt, Gandhian, is an exemplary champion of social causes. Her work has brought her and our country world renown and recognition. She has transformed poor and under-privileged women into proud, confident, self-organized and courageous citizens of our country. Shri. N.R. Narayanamoorthy, who led our nation on the path of becoming a world leader in Information Technology, is an inspiration to the youth of our country. I take great pleasure in inaugurating the celebrations of the Platinum Jubilee of Bharatiya Vidya Bhavan and the 125th Birth Anniversary of its great founder, Kulapati K.M. Munshi.